Rina's Rainbow: Eager Theater by K.I.D.S Center! A Summer Workshop for Kids! Eager Theater by K.I.D.S Center! A Summer Workshop for Kids! Rain's still too young to enroll in a summer workshop for now but when she grows up, and if she wanted to, I would like her to take either ballet (so she will learn how to move gracefully and I can dress her up in pretty pink tutus), and also I want her to try theater acting. So she won't be as shy as me growing up. That's why I hope the workshop I'm about to share with you would still be around in 3-4 years hehehe. K.I.D.S. 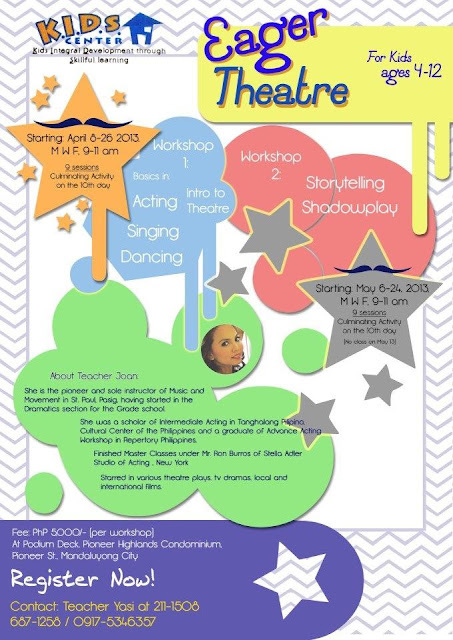 Center (Kids Integral Development through Skillful Learning) brings you Eager Theater A workshop for kids ages 4-12 that teaches introduction to theater (basics in acting, singing, and dancing) starting on April 8-26, and there is also storytelling, and shadow play which starts on May 6-24. It is facilitated by Teacher Joan, who happens to be the sole instructor of music and movement in St. Paul Pasig. She also started the dramatics section for grade school so you can be sure she knows well how to teach aspiring kiddos! Check the poster below for more amazing credentials of Teacher Joan! So register your kids now! ...hence the number of Disney-relate posts! :-) Click here to read them! For a mom's "Me" time! Short Stories: Figaro Treats with Globe Rewards! Rain's Awesome Easter Sunday: A DIY Easter! Refurbishing my wheels at JDM Wheelz! Finally, Anti-Acne Products That Work for Me: AcneCare! Content and photos by Rina Zamora except for press releases or unless stated otherwise. . Simple theme. Powered by Blogger.